I Believe that's half a bike flying. Photo taken during the Women's Scratch at the Indoor World Championships in Denmark 2010. 17 year old rookie Julie Leth crashed near the perimeter and slid across the track just in front of the peleton which led to a minor incedent. ;o) I saw at least 3 riders ride directly into her back.. .anyhow Julie got on her bike and finished 9th. Yikes. 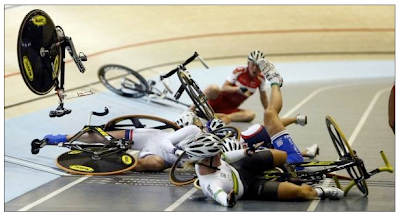 I never crashed during my time as a track racer, but I sure came close. I guess I just didn't do it long enough. Did carbon the word over stop breaking after this accident?